The new Kindle Paperwhite ereader sports several improvements, including a crisper screen and a night light, but is it worth upgrading? The build up to Christmas has begun. That means it's time for Amazon's yearly tweak of its Kindle ereaders. With the finest ebook delivery service going it would be easy for Amazon to rest on its laurels and rake in the royalties, but instead its made several improvements on the original Amazon Kindle Paperwhite. These include a crisper screen that's more touch responsive, with an even brighter light for night reading and added a faster processor for speedier page turns. Launched shortly before the Kindle Fire HDX 7- and 8.9-inch tablets, and going up against the Kobo's latest models, the new Kindle Paperwhite (2013) certainly sounds good, but is it worth upgrading? All will be revealed in the next few chapters! One of the Kindle's plus points is its robust build. There's enough grip around the edge of the screen for it to be carried without brushing the screen and accidentally flicking through pages. The back has a plush, almost tacky feel that again helps you maintain your hold when jostled on public transport. This is not the smallest or the lightest ereader available - the addition of the light means it's weightier than a regular Kindle - but it's perfectly pocketable. A whole lot of improvements have been made since the original Paperwhite. They're subtle. Don't expect to be blown away by the boost in screen clarity, but if you're reading for long periods the higher contrast, which makes the text standout more clearly against the white page, will save your eyes somewhat. Amazon claims the new Paperwhite's touchscreen has a 19% tighter touch grid compared to the previous model, again the improvement is slight, but useful. We noticed the improvement most acutely when typing in a Wi-Fi password and attempting to use some of the Kindle's new reading features, PageFlip and Smart Lookup - more on that in a moment. It's still a little too easy to flick through pages by mistake when trying to access the drop down menu at the top of the page. The Paperwhite's built-in light is bright without leaking too much light - your partner will thank you for that when you're reading in bed. Do remember to turn the brightness down when you pick up your ebook the next morning. It's easy to forget, as adjusting it can be quite fiddly - tap the bulb from the drop down menu and swipe to turn off - and if left on it will drain your battery quickly. Amazon's ebook selection is still the best around and with apps for most smartphones and tablets it's easy to switch your reading between devices - hook them all up to Wi-Fi and you'll never lose your page. There are a few new features included with this generation of Paperwhite and they're mainly aimed at students and academics. Kindle PageFlip allows you to skim through an ebook without losing your place - it opens in a window on top of the page you're on and is ideal for ebooks with multiple references and footnotes. Then there's Smart Lookup, which gives dictionary definitions of words as well as Wikipedia explanations. For deeper reading there's also Kindle X-Ray. It's supposed to recognise characters, themes and historically important events throughout the book - press and hold on the text in question to bring up biographies and other data. A nice idea, but in practice it's a bit juddery; this is no York Notes quite yet. You can also share quotes or passages, or tell people how much you've enjoyed your latest read via Facebook and Twitter. Thankfully, unlike Kobo's ereaders, this feature is unobtrusive rarely prompting you to share. A single charge might not last you the eight weeks quoted - that's based on just half an hour's reading a day - but it will keep going for more than twenty hours. The more you use that light, the more quickly you'll need to plug in. If you're yet to buy an ereader there's a lot to like here. The improvements are small, but significant enough to make this the best Kindle yet and the best ereader around. If you already have a Kindle 4 or below, it's probably worth upgrading for the bonus of that night light. 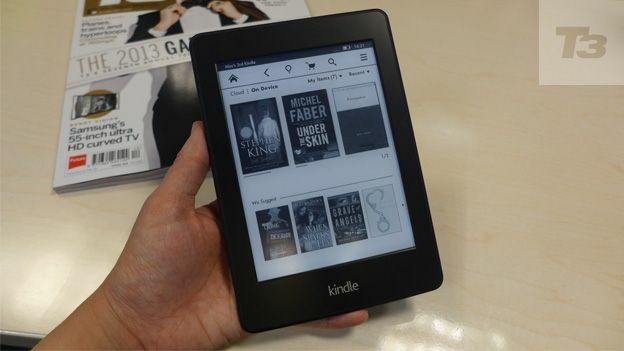 If you have last year's Kindle Paperwhite, however, we suggest you save your pennies.